I don't really have "Sarah Palin bikini pictures," but I just read at Ace of Spades that this headline will attract Google traffic from idiots trying to find something scandalous about Governor Palin. So I am testing the theory myself. In the meantime, if you are an idiot liberal who thought you would find something useful for the campaign, read one of these instead. You just might learn something useful for real life instead of politics. update - visit counter added 9-6-08 after more than 2000 hits to this post. Take a moment from the idiocy that is about to descend upon us in the form the DNC convention this week and read about a novel published in 1922 with implications for Ayn Rand's later novels as well as the business cycle that plagued the American economy throughout the 20th (and into the 21st) century. 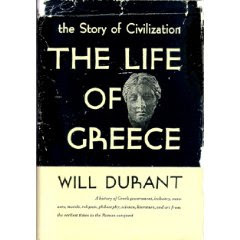 Athens (4th Century); Will Durant; Plato; Aristotle; Dionysus; Philip of Macedon; parallels to 21st Century U.S.
(1) Will Durant wrote these words before our current political, economic and moral problems had fully taken shape. He was not taking sides in our current battles. He had never heard of George W. Bush. He might have anticipated, but had not experienced, the modern state of the 21st Century Democrat party. He had no axe to grind in our modern day political wars. If anything, Durant was a liberal, having left the Catholic Church due to his atheism and having adopted socialism in his youth (he had also affiliated with many of the leftist icons of the early 20th Century such as Margaret Sanger and John Dewey). Durant described the decline of ancient Athens from a purely historical perspective without anticipating how this description could be used in our century. (2) This story ends badly. In the 4th Century B.C., the Golden Age of Athens had recently ended. Athens had entered into a period of decline. Athens was beset by many problems that will sound familiar to those of us that must endure the 21st Century A.D. The class warfare, resulting welfare state, inevitable confiscatory taxation and widespread tax evasion amounted to only one aspect of Athenian decline. Atheletics were professionalized; the citizens who in the sixth century had crowded the palaestra and the gymnasium were now content to exert themselves vicariously by witnessing professional exhibitions. ...the rhetors or hired orators who in this century became professional lawyers and politicians. Some of these men, like Lycurgus, were reasonably honest; some of them, like Hypereides, were gallant; most of them were no better than they had to be. If we may take Aristotle's word for it, many of them specialized in invalidating wills. Several of them laid up great fortunes through political opportunism and reckless demagogy. The rhetors divided into parties and tore the air with their campaigns. Each party organized committees, invented catchwords, appointed agents, and raised funds; those who paid the expenses of all this frankly confessed that they expected to "reimburse themselves doubly." (Citation omitted.) As politics grew more intense, patriotism waned; the bitterness of faction absorbed public energy and devotion, and left little for the city. As civilization develops, as customs, institutions, laws, and morals more and more restrict the operation of natural impulses, action gives way to thought, achievement to imagination, directness to subtly, expression to concealment, cruelty to sympathy, belief to doubt; the unity of character common to animals and primative man passes away; behavior becomes fragmentary and hesitant, conscious and calculating; the williness to fight subsides into a disposition to infinite argument. Few nations have been able to reach intellectual refinement and esthetic sensitivity without sacrificing so much in virility and unity that their wealth presents an irresistable temptation to impecunious barbarians. Around every Rome hover the Gauls; around every Athens some Macedon. And around the United States hover Islam, Mexico, etc. The conditions about which Durant wrote ended when Athens was conquered by the Macedons later in that century. Athens could no longer resist foreign enemies. Its economy was weakened by taxation, its population depleted and demoralized by Athens' own sexual revolution and its civic life destroyed by political activity in which Athenians regarded each other with more hostility than any foreign enemy. Athens would disappear (and with it its contributions to art, science, literature, etc.) as it was absorbed into the Macedonian empire of Philip and Alexander. While the Macedonian empire would briefly rule the known world, it, too, ultimately ended as Greece, itself, would disappear from the world map for 2000 years. Moral decay, high taxes, redistribution of wealth, government programs, class warfare, etc. have consequences. Those consequences last far beyond the temporary political advantage that one faction may gain in the present. Future archeologists may find names like Barack Obama, Nancy Pelosi, the Clintons or John Edwards in the ruins of our civilization. But those names and their "achievements" will pale in comparison to the story of our own decline and its consequences. Osama is not Ho Chi Minh, and al-Qa'eda are not the Viet Cong. If you exit, they'll follow. And Americans will die - in foreign embassies, barracks, warships, as they did through the Nineties, and eventually on the streets of US cities, too.